Mr Tharoor had earlier sent a legal notice to Mr Prasad, the minister for law Justice and IT, seeking an "unconditional apology" for calling him a "murder accused". Shashi filed a complaint before the Thiruvananthapuram Chief Judicial Magistrate court. Senior Congress leader Shashi Tharoor has filed a defamation case against Union minister Ravi Shankar Prasad for allegedly making derogatory remarks in connection with his wife, Sunanda Pushkar's death. Mr Tharoor had earlier sent a legal notice to Prasad, the minister for law Justice and IT, seeking an "unconditional apology" for calling him a "murder accused". The complaint was filed before the Thiruvananthapuram Chief Judicial Magistrate court. Mr Tharoor stated in the complaint that the investigation in the Pushkar case had been completed and the Delhi Police had filed a final report before the Additional Metropolitan Magistrate court, in which he was charge sheeted under Sections 308 and 498 A of the Indian Penal Code. "The final report does not state that the death of the deceased was a murder", Mr Tharoor, who appeared in the court on being summoned and was granted bail, stated. He alleged that "it was after much pressure from the external power Centres" that the Delhi Police charge sheeted him, years after Sunanda's death. He alleged that it was a "conspiracy to frame him in a false case". The Thiruvananthapuram lawmaker and former Union minister said that on October 28 around 5.38 am, Prasad had posted a 2 minute 18 seconds video clip of his press conference, along with certain "false, untrue, malicious and highly defamatory statements on Twitter". 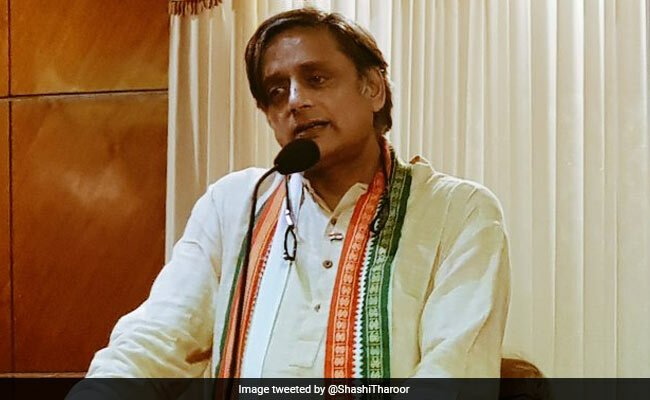 Mr Tharoor alleged that the video had been posted to defame him and thereby to "spread an untrue, false and scandalous imputation" against him that he is a "murder case" accused and that he had been charge sheeted. This was intended to "harm" his reputation and "malign" him before the public "by intentionally giving such false and untrue statements, the colour of his office, he said. "It is evident that the impugned post/tweet and the contents are solely intended to malign and tarnish the reputation of the complainant", he stated. Tharoor had sent a lawyer's notice to Mr Prasad, seeking an unconditional apology within 48 hours of the receipt of the notice, for levelling the allegations and to delete and remove the video clip of his press conference, along with defamatory statement on Twitter.